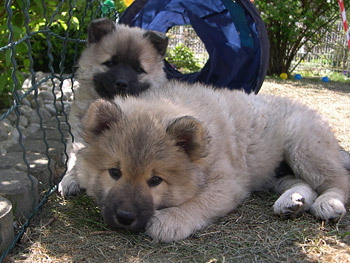 Hello Eurasierfriends your family wants to adopt a Eurasier and everybody does agree? This “charmeur” will enrich your family but the responsibility can last 10 to 15 years. We hope that you arranged the time for walks, care for fur and body and the “cuddling”? More than 4 hours a dog should not be left alone and especially a puppy should be near to his human pack all the day. You inspected walking trails? Surely you have thought about the caring and responsibility if you are either sick or through other circumstances not in a position to do this? Your holidays are planned together with the dog? If you are living in a flat, ask for a written permission for dog keeping. The first weeks the puppy should not run the staircase up and down, but take him on your arms these ways. You surely have in mind that the dog needs not only a special food; but the costs for the shots, perhaps vet costs, dog tax and insurance have to be calculated. If all these points have been checked out and if you are sure that all qualifications are o.k., a puppy could be adopted by you. Please buy your puppy only from a breeder organzised in a Eurasier-Club belonging to the VDH, so you can be sure of a controlled and scientific based breeding. The name “EURASIER” is not protected. 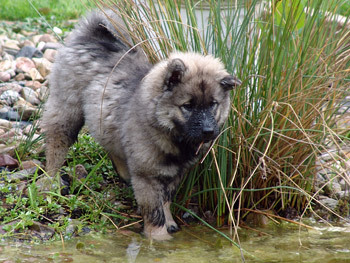 Often the Eurasier is offered in magazines and in the internet and often these dogs are only similar to the Eurasier and are sold at a high rate. For instance the colour white is included in the breed, although the Standard does not allow this! 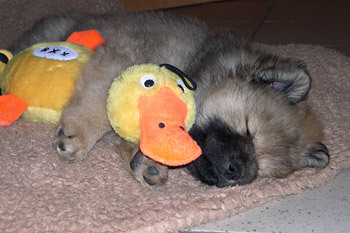 In the VDH-Clubs you surely will have to wait for a puppy a bit longer, but you are on the safe side. You get a puppy which is raised within the family and is familiar with humans and all house- noises. You can attend to a Eurasier- meeting getting further informations we like to give you. If you pick up your puppy with food, a feeding information, collar and leash, the breeder will surely have some tears when saying good bye to your family. You and a second person for caring for the puppy will start the tour home. If your trips lasts longer, you have to stop so that the puppy can defecate and drink. After reaching your home you can show your puppy a place in your garden for his defecation which he may use at any time. This may prevent that your house will be “decorated” by your puppy due to stress. In a calm corner you can deposite either a dog basket or a dog bed so that the puppy can watch his family. Sometimes the puppy is choosing his place by himself, perhaps under the table or a chair as this is a little bit like a cave. The first nights the puppy should be near to you so that you can pet him or he can ask for going outside. The bowls should not be slippery and easy to clean. There are available twin-bowl-combinations which can “grow with your puppy” in the height. Lots of typical toys with and without squeaks, balls of gum, pine cones, sticks and ropes. You surely made your garden “puppysafe” as the puppys can dig phantastically. If you own a pond, he should either have a very high wall around, or the water should be taken out of it or it should be covered. Take special care for toxic plants. You have carpets in your home? Put them away for the first time as the puppyy like to play with the threads. Very much he like electricity wires, telephone books and catalogues if he can get these things. Puppies like confetti very much. Have a lot fun with your puppy!